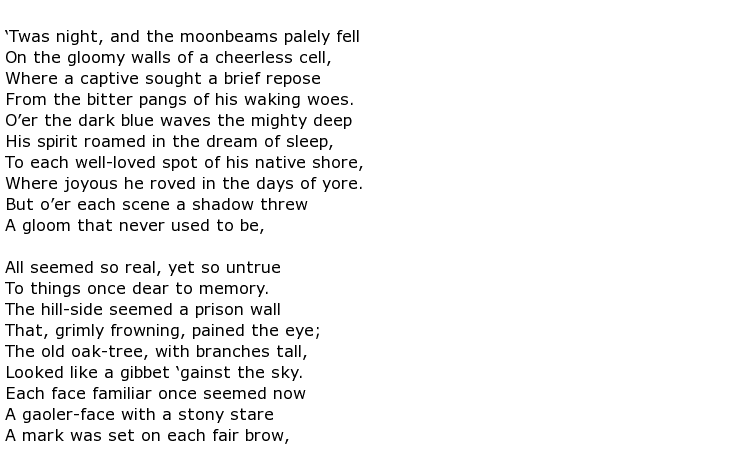 Owen Suffolk was a 19th century Australian poet who arrived on Australia’s shores in 1847 having been transported from his home in England because of serious criminal activities. Here continued his criminal ways and took to the life of the “bushranger”, effectively hiding from authority wherever he could and resorting to stealing from passing travellers just to get by. In between times though he found the time to be a prolific writer of poetry and he is famous for an autobiographical account of his criminal way of life called Days of Crime and Years of Suffering, published in 1867, although this book was started while he was actually in prison. He is remembered in the history of Australian literature as the “Convict Poet”, obviously because he spent so much of his life behind bars. He was born on the 4th April 1829 into relatively comfortable circumstances in the Middlesex town of Finchley. Unfortunately his father got into financial difficulties and Owen was sent away to serve aboard a ship while still quite young. This was not a happy experience and, when he returned, he found that his family home was not there any more and it was not long before he was serving his first period of detention, for stealing, at the age of fifteen. Other offences, including forgery, followed and at least two more prison sentences were served before the decision was taken, at the age of 18, to transport him to Australia for at least a seven year term. Suffolk soon took up a fairly colourful life in the state of Victoria and often found himself on the wrong side of the law. He was frequently incarcerated until, in the summer of 1866, he was granted parole, called at that time a “ticket of leave”. This basically gave him his freedom but this was conditional. He was obliged to board a ship bound for England and never return to Australia again. Thus, ironically, began a second period of transportation, back to where he had begun. While in prison he had been entrusted with some clerical work and, although the authorities were pleased with his work, once released it was discovered that he had interfered with other prisoners’ records. Once Suffolk was back in England it did not take him long to fall into his old ways. He now added new crimes such as horse theft, swindling money from vulnerable women and marrying bigamously. He did not escape justice for long though and, for his latest crimes, he earned a sentence of 15 years penal servitude. He was in his early fifties when he was released from prison and he married again in London. His criminal past was not yet behind him though and it seems that he cheated the lady out of a substantial amount of money and then faked his own death (by drowning) to escape justice. He managed to get away and boarded a ship for the United States. The last known reference to the life of Owen Suffolk shows that he was living well in New York, perhaps carrying out yet more confidence tricks on the female population of that city! There is no record of the date of his death.